The juvenile Clark's Grebe in the top pic doesn't appear ready to be far from it's parent though it appears too large to ride on the parent's back. I have seen some this side at least try to climb onto the parent's back but the parents seemed to discourage it by swimming away. 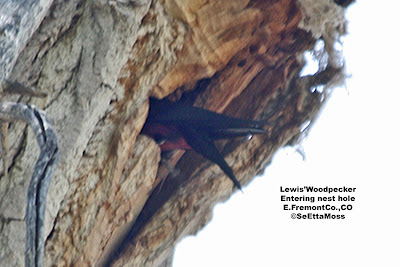 As can be seen, the juvenile has it's bill wide open--it may be calling to the parent to feed it. The young Clark's Grebe in the bottom pic was swimming about 20 feet away from than the parent grebe that sleeping (they sleep on the water with their heads tucked in). It does appear to be an older chick (though not as old as the one in the top pic) and apparently both it and the parent considered it old enough to practice a little independence while the parent got some shut-eye. Fortunately this juvenile and it's parent were near the large vegetative mat on the lake which motor boaters and ski-doos stay away from as the vegetation clogs their blades. 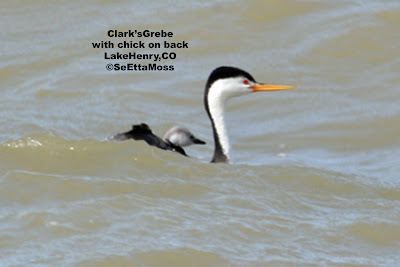 I made a quick trip to Lake Henry yesterday and was rewarded by the sight of a number of Clark's and Western Grebes still with chicks on their backs and some juvenile grebes learning to be independent. 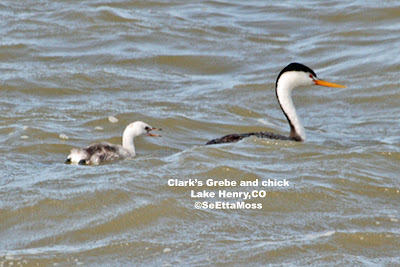 These pics are of a Clark's Grebes that was still "back-brooding" (brooding their young on their backs) its chick. The downside of the trip was the many ski-doos and motorboats that were on the shore near the 40 recreational vehicles that were already camped there and there would likely be a number more arriving later yesterday and today with their motorboats and ski-doos. While I was there, I watched 2 ski-doos driving very fast across the lake causing grebes to dive for their lives. 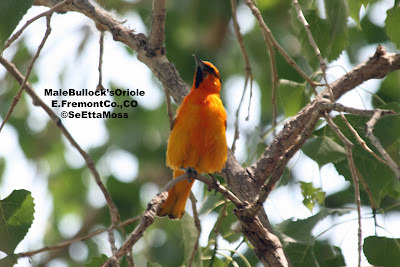 Male Bullock's Orioles, they species found here in the west, have such brilliant orange plumage, but it only shows up when you can get a pic in good light. 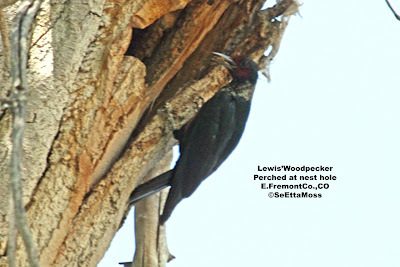 That can be a trick since this species spends a lot of time under the canopy of large trees where their mates are nesting. 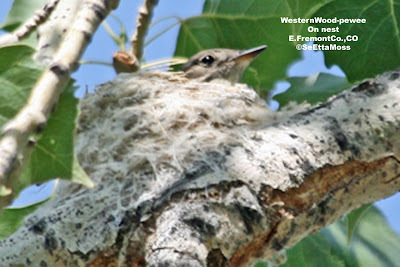 This pic shows a Western Wood-pewee on it's nest that I found next to the Arkansas River near Canon City. I am beginning to think that this bird is young as I have walked by this nest daily, usually twice a day, and only seen a bird on it one time in 2 weeks (certainly she may be on the nest for many hours when I'm not there).